Hockey Hall of Fame MVP Trophies and Winners tells the story of hockey's three most prestigious individual awards: the Hart Trophy (Most Valuable Player of the NHL regular season), the Ted Lindsay Trophy (MVP of the NHL regular season as voted by the players) and the Conn Smythe Trophy (MVP of the NHL playoffs). The authors present the history and origins of each trophy, as well as a biography of those whom the trophies are named after. Authors Bob Duff and Kevin Shea profile every winner of each trophy and make their own selections for the winners of each award in the seasons preceding each trophy's existence. Solid photography compliments the book. MVP Trophies and Winners recounts the most controversial selections and surprise winners. 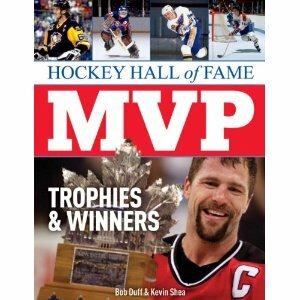 Readers will be able to relive the best seasons and performances hockey has ever seen as Duff and Shea profile the NHL's multiple MVP winners and the most seminal seasons ever recorded. This is perhaps the most fascinating undertaking in the book. The authors are MVPs of their own world. Bob Duff is a hockey historian and a member of the Society for International Hockey Research. He is the sports columnist for The Windsor Star and covers the NHL for MSNBC.com. He was previously a featured author in the Hockey Hall of Fame Book of Goalies and is the author of the Johnny Bower biography The China Wall. Kevin Shea is a hockey historian and best-selling author. He is the editor of publications for the Hockey Hall of Fame and teaches hockey history at Seneca College in Toronto, Ontario. He is also a member of the Toronto Maple Leafs Historical Committee and the Society for International Hockey Research. His most recent book is Toronto Maple Leafs: Diary of a Dynasty, 1957--1967.